(1) We are all guilty, including the victim, and stand in need of forgiveness. (2) We are all forgiven, including the perpetrator. (3) Therefore, the future is a community of love (embrace). Don’t read these three challenges in the abstract. Think of an horrific case of evil – one that has happened to you or someone you care for – and read these challenges in light of the realities of that particular case. 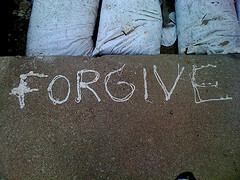 Is forgiveness really possible? Is it desirable? And does Volf’s understanding of the distinctive approach of Christian forgiveness make embrace possible? As Volf made clear in the Q and A following his lecture, he is not saying that there are no blameless victims, that the victim must always take some of the blame for the evil that happens to them; not at all. What he is saying is that we all need forgiveness for something. The world is not divided into victims (me) and perpetrators (you). We all (us) stand guilty of something. We are all beneficiaries of forgiveness. We all need someone to forgive us. We all need God to forgive us. And what we have received we must be willing to share. Recognizing that the perpetrator already stands forgiven because Christ died for all does not mean that forgiveness and reconciliation between human beings are not required. What it does is allow us to see the perpetrator as a human being, as one who also is loved by God, and not as a monster. Humans can be forgiven, monsters can’t. Human beings can do monstrous things to other human beings but because of the love and forgiveness of God they remain, somewhere within, a human being who needs forgiveness just like us. Volf knows that repentance and restitution are crucial to the receiving of forgiveness, that embrace does not result simply because the victim forgives. The Christian gospel, like many other religious and secular theories of forgiveness, requires from the perpetrator a willingness to be forgiven – a willingness to admit their guilt and a willingness to take responsibility for the damage they have done. But the Christian gospel frames the role of the forgiver in a distinct way. Knowing that we are forgiven people and that they are forgiven people makes true forgiveness possible. It doesn’t make it easy; it makes it possible. It means that there is a space – already created by God – where we can all come together and participate in God’s community of grace. (1) Is this a reasonable description of the Christian gospel? (2) Is this approach to forgiveness distinctive to the Christian gospel? (3) Is it possible in practice to act on this approach to forgiveness or is it just pious theory? (4) Will this make you approach forgiveness differently the next time you are wronged? Great article. Forgiveness and reconciliation is the only forward for us personally, within churches and for nations cp Bishop Desmond Tutu’s book ‘No Future Without Forgiveness’ written in post appartied South Africa. Thanks. We have Tutu’s book in the college library. The “truth and reconciliation commission” provided evidence that when forgiveness is treated seriously it is not just a personal good but it is also a social good. Reblogged this on Grasping Noumenon. Its interesting to read this as I am part way through a study of the biblical basis for the twelve steps. In my experience, our churches spend a lot of time talking about forgiving those who harm us, which is very good. However, if this is a dominant focus for us, we can easily fall into the trap of victimisation and blame- the problems in my life are someone else’s fault, which justifies us keeping on doing the same old things whether they are biblical, godly or not. In the twelve steps there is not one step that focuses on forgiving others- interesting! Is that an oversight or deliberate? What there is, is a repeated cycle of making a moral inventory of ourselves- what have I done wrong, how have I hurt others or grieved God? In the process of looking at that inventory of myself, the first step is to identify my resentments and what sins have come from this boiler room in my soul. So forgiveness is part of repenting from my resentments and turning my life over to God so he can by his divine power help me to overcome the defects in my character. An entirely different approach, if I have understood the 12 steps. Interesting that these steps have been developed where people realise their life is not working as it is. From a Christian perspective, as the 12 steps were originally intended, does this mean we are truly grappling with the log in our own eye as our first priority which equips us for all other relationships, including forgiving those who have harmed us?